Broken teeth, damaged gums, or even lost teeth can feel uncomfortable and impact your self-esteem. While cosmetic treatments are available to cover these surface flaws, sometimes the best course of action is to repair your smile from the root up. From extractions to replacement teeth, Dr. Hughes, Dr. Mojdami, Dr. Cakmakci and our team can craft a brand new smile for you, no matter how much damage you have sustained over the years. Dental implants are a unique tooth replacement option that is quickly growing popularity among patients who have lost one or more teeth. Durable, long-lasting, and hand-crafted to look natural, these dental implants can easily replace a lost tooth and blend into your natural smile with ease. Treatment takes place over a few weeks to a few months, depending on your jawbone condition and number of implants you need. Do keep in mind that while this treatment takes time to complete, it has nearly a lifetime of benefits. Durability: Dental implants are constructed from a combination of titanium and porcelain. The titanium holds the implant together and melds seamlessly with human bone, while the porcelain crown imitates a real tooth in shape and durability. You can enjoy your favourite foods with little to no worries about damaging your implant. Long Lifespan: Dentures and dental bridges undergo normal wear and tear, which only gives them a lifespan of about five to ten years. However, dental implants have been known to last much longer due to their integration with the jawbone. Natural Appearance: Dr. Hughes, Dr. Mojdami, Dr. Cakmakci and our team will work hard to make sure that your porcelain crown looks as natural as your real teeth. This is essential to making sure that it blends into your smile like a native tooth would. Advantage of Osseointegration: This is a fusion process unique to dental implants, making them stand apart from dentures and dental bridges. 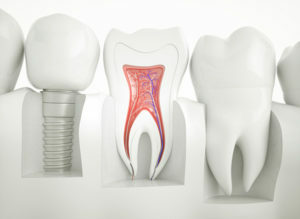 Osseointegration is when the titanium material of the implant triggers the surrounding jawbone to wrap fibers around it. This secures the implant into the jawbone, making it permanent and stable. No other tooth replacement option can do this. Every person has at least two molars in both corners of their smile (four on top and four on bottom). However, wisdom teeth are “third molars” that can appear later in life – between the ages of 18 to 25. Since these teeth emerge so late, they may cause a few complications for patients who don’t have the space for them. Why Get Your Wisdom Teeth Removed? Most patients do not have the space to accommodate wisdom teeth. If left untreated they can become susceptible to overcrowding, cysts, infections, and more. Overcrowding: As the wisdom teeth erupt, they can push the other teeth forward. This displaces them and changes your bite pattern. This could lead to teeth grinding, soreness, and jaw pain as your bite pressure begins to change. Cysts: Cysts are infected pockets that develop under the gums. They could fill with fluids and be sore to the touch. They are also dangerous if they burst and spread the infected fluids. Infections: An infection that develops near the surface and around the wisdom tooth, can spread to neighboring teeth. Pain and Soreness: Aside from the symptoms above, wisdom teeth can feel painful as they erupt, shift teeth and result in soreness while chewing or opening and closing your mouth. Full mouth reconstruction is a term for extensive repair on a smile, which may involve two or more treatments. Whether it’s replacing lost teeth, broken teeth, multiple fillings, root canals, etc, the goal of a full mouth reconstruction is more than superficial. It’s to restore full functionality. What’s Included in a Reconstruction? Root Canals and Fillings: A root canal clears out diseased tissues in the center of your tooth. It’s then filled in with a tooth-colored resin to preserve the tooth and protect it. If you have other cavities in your mouth, they may be filled in as well. Inlays/Onlays: When large chunks of your tooth have been damaged or broken off, it’s important to save what’s left. An inlay/onlay is a combination of filling and crown that fills in the space that was broken, especially the cusps and ridges of your teeth used for eating. Dental Crowns: The purpose of a dental crown is to cover a tooth entirely, in order to protect it from disease or from further damage. These are crafted just like your natural teeth, through the help of digital scans. Implants and Bridges: For teeth that have been lost completely or need to be extracted, they can be easily replaced with a durable dental implant or covered with a dental bridge. Patients have found success with both options, although dental implants tend to be the device that lasts the longest. Ask us about which one might be right for you. Whether you need to fix a missing tooth, or have been enduring years of a damaged smile, we have the surgical treatments you need to restore your smile to it’s beautiful state. Contact our Toronto, ON office and schedule a consultation with Dr. Hughes. We’ll walk you through your options and discover what treatments are best for your situation.